This article will provide you unique ideas that will help you keep pumping out great content. The following 13 content ideas are designed to help save you time and stimulate some new ideas. By the way, if you’re following the blogging basics outlined here, you’re well on your way to creating and maintaining the kind of content that will keep readers coming back for more. And if you’ve been blogging for any length of time, you know that when you don’t post on your blog for a few days, your traffic takes a nosedive. Here’s ideas to get you going. In the context of blog outreach, I mentioned Technorati and Alltop in my article on The Secret to Growing Your Blog Following. Both sites are also great sources for finding what other bloggers are posting about your topic. When you’re stuck, do a keyword search on Technorati. Set up a channel on Alltop with blogs in your industry to scan what’s new at a glance. Monitor blogs in your field by subscribing to influential blogs by email or subscribe to blog feeds with your preferred feed reader. You want to find out what your competitors and other experts in your field are discussing. Not only will you get inspiration for your own writing, but you’ll stay on the cutting edge of your field. 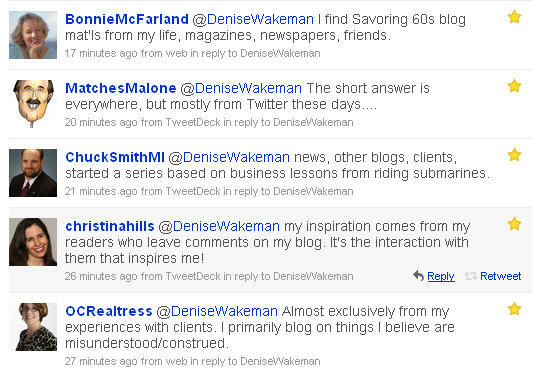 Other bloggers’ posts are often useful jumping-off points for writing your own. Some bloggers simply report on somebody’s post, link to it, and that’s it. A more strategic way to do this is to either agree with the blogger you’re citing, disagree, or add your own perspective. 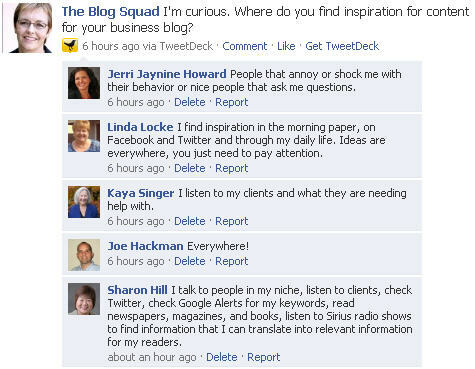 Adding to the conversation makes your blog more valuable. Although you can read a lot of good stuff in the blogosphere, it hasn’t all been said. Use the good stuff as inspiration and ask yourself, what can I add to that? The blogosphere loves controversy and a good argument. How can you stir things up and encourage your readers to interact and comment? This is a great tool that can boost readership and encourage people to come back to vote and share with friends. Set up a poll as a blog post or in the sidebar, and ask readers to vote on their biggest challenge, their worst nightmare—you name it—as long as it’s relevant to your topic. What do you want to know from your readers? Ask them. There are many free polling services that enable you to add polls to your blog: Polldaddy and Vizu are two I frequently use. Use poll results as fodder for writing additional follow-up blog posts, an article, or a media release. Announce your own live events, speaking appearances, products, and services. Any time you have something new going on, let your readers know about it by writing a post for your blog. If you’re writing press releases for your business, post those on your blog as well. Share information and tips you think might interest readers. Do it in a way that provokes a conversation, rather than reporting on topics as a journalist. This is also an opportunity to ask your readers for their perspective. Remember, an important reason to blog for your business is not just to disseminate information, but also to engage in a conversation with your readers. Take a few minutes to make a list of the main topics you’re blogging about, and then make a list of three or four subtopics. If you think about it, when you’re focused on your reader and your expertise, most of what you’re going to be blogging about falls under five to seven main topics. Once you’ve got the list, set up a simple editorial calendar. Each day, you can write about a particular subtopic. On Monday, you write about subtopic A. On Wednesday, you write about subtopic B. On Friday you write about subtopic C. This gives you focus for each day of the week, so when that day comes around, you don’t find yourself wondering what to write about. Similar to doing a poll, throw a question out to your communities on Twitter, LinkedIn and Facebook. You’ll probably get an immediate response. When you don’t have time to write, you can write posts in advance and postdate them so they’re published on the days you’re away. But if you’re really pressed for time, a great way to avoid a gap in blog posts is to ask someone who writes on a similar subject to be a guest author. This is a win-win-win. 1) The guest blogger writes a few posts while you’re away, giving you content. 2) The guest blogger gets links back to his or her website or blog, as well as exposure to your readers. 3) Your readers get new perspectives on your subject. It sounds funny, but this happens. After you’ve been blogging for a while, you develop blog antennae. You’ll find yourself continually scanning the web, newspapers, magazines, email, and even your own personal experiences for interesting items to blog about. Expect this to happen after you’ve been blogging for a couple of months. Even the slightest life challenge or mistake can become fodder for great blog posts. But to make that happen, you have to keep your ears and eyes open and receptive. The good news here is that just about any event can make an interesting blog post. Make sure to jot down your ideas and keep a running list. About 90% of my blog ideas never get posted but they serve as great inspiration when I feel at a loss. Here’s a great tip for creating content and building readership and getting links back to your blog: Make a list of your top 10 favorite blogs in your industry. Generally the people on that list will be excited because they made the list. More than likely, they will write on their blog about you and your list because they’re going to be tooting their own horn: “I just made so-and-so’s list of favorite blogs.” It’s a great way to get known and build readership. When writing about nearly anything, your content can be more valuable and unique when you can refer effectively to the classics, history, or authoritative books written about the topic being discussed. Many people in the blogosphere treat content superficially. How can you place your product or service in historical context? 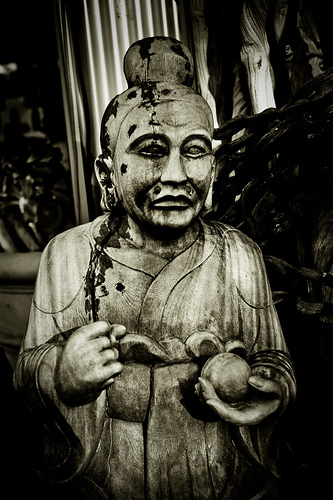 A great example is a post on Copyblogger called 5 Essential Blogging Tips from the Father of Chinese Philosophy. By adding depth, you add value to your blog. This helps position you as a thought leader and a credible expert in your field. Now it’s your turn! I would love to add more ideas to my list. Where do you find inspiration for your blog posts? Please share your tips and resources in the comments.